With construction activity flourishing, the webcast will disclose what economists in the construction industry expect for the months ahead. ConstructConnect’s complimentary May 10th Webcast, featuring three of the sector’s top economists, is specifically designed to help you navigate through some uncertainty. All three economists will take questions in the last half hour of the session. The free webcast is open to all. AIA members who attend the live webcast are eligible to receive 1.5 AIA CEU credits. Kermit Baker is the chief economist for the American Institute of Architects. In this capacity, he analyzes business and construction trends in the U.S. economy and examines their impact on AIA members and the architectural profession. Kermit originated the AIA Architecture Billings Index, as well as the AIA Consensus Construction Forecast Panel. He has a Master’s degree in Urban Planning from Harvard University and holds a Ph.D. from Massachusetts Institute of Technology in the same field. In 2002, Kermit was named honorary member of the AIA. Alex Carrick is the North American Chief Economist for ConstructConnect and CanaData. Alex has been analyzing U.S. and Canadian construction activity for more than 40 years. An award-winning author, Alex has leveraged social media and the ConstructConnect blog to become one of the most prominent authorities on the construction economy. He is regularly quoted and interviewed by major news outlets, and regular contributor to the Daily Commercial News and the Journal of Commerce. Alex has a Bachelor’s in Economics from the University of Western Ontario and a Master’s in Economics from the University of Toronto. 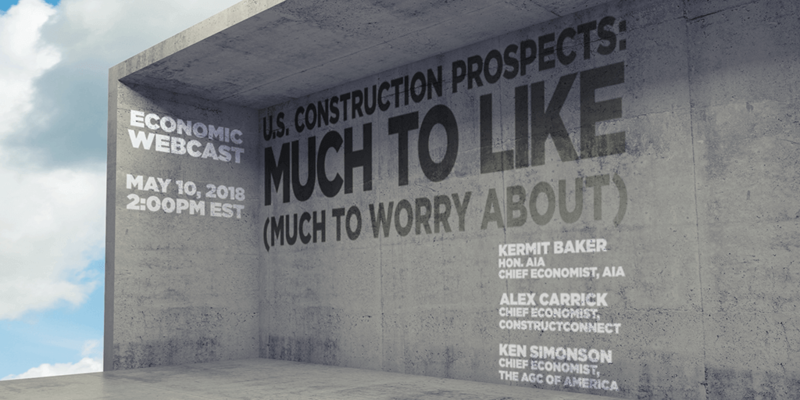 Ken Simonson has been the chief economist of the Associated General Contractors of America, a leading construction industry trade association, since 2001. Ken has more than 40 years of experience analyzing, advocating and communicating about economic and tax issues. His weekly Data DIGest goes to 47,000 subscribers. Ken is a Fellow and past president of the National Association for Business Economics, and he serves as an appointed member of the Census Scientific Advisory Committee and the Bureau of Labor Statistics’ Data Users Advisory Committee. Ken has a BA in economics from the University of Chicago and an MA in economics from Northwestern University. Laura Marlow is the Vice President of Strategic Partnerships at ConstructConnect. She manages relationships with AIA, AGC, USGBC and many AEC industry partners. Laura also leads ConstructConnect’s corporate social responsibility and sustainability efforts. She graduated from the University of South Carolina and is a LEED AP. Can’t make the time or date? Webinars will be posted in ConstructConnect’s Resource Center—and watch when and where it’s convenient for you. A recording of the webcast will be available after the webinar has been completed.